HOLLYWOOD (Perfect Music Today) 5/12/18/–Acclaimed singer, songwriter and performer Courtney Marie Andrews will embark on an extensive headline tour this fall with stops at Austin’s The Mohawk, Brooklyn’s Rough Trade, D.C.’s Rock & Roll Hotel, Chicago’s The Hideout and L.A.’s The Moroccan Lounge among many others. Tickets go on-sale this Friday, June 15 at 10:00am local time. In addition to the headline dates, Andrews will also perform at several festivals this summer including a newly announced stop at Newport Folk Festival in July. See below for complete details. The tour celebrates a landmark year for Andrews following the release of her acclaimed new album, May Your Kindness Remain, which resulted in a recent nomination for “Emerging Artist of the Year” at the 2018 Americana Music Association Honors & Awards. 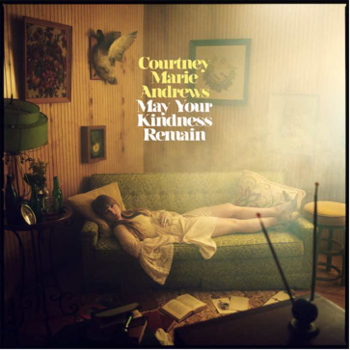 Produced by Mark Howard (Lucinda Williams, Bob Dylan, Emmylou Harris, Tom Waits), May Your Kindness Remain is out now on Fat Possum Records/Mama Bird Recording Co. and continues to receive overwhelming praise…. In addition to Andrews on vocals and electric/acoustic guitar, the album features Dillon Warnek (electric guitar), Daniel Walker (organ, Wurlitzer, accordion), Charles Wicklander (piano, Wurlitzer), William Mapp (drums, percussion), Alex Sabel (bass) and C.C. White (background vocals). The new album is the follow-up to Andrews’ breakthrough album, Honest Life, which received overwhelming acclaim and landed on multiple “Best of 2016” lists, including at NPR Music, Rolling Stone, Stereogum, The Bluegrass Situation, American Songwriter, Paste Magazine, Folk Alley and ABC News among others. The Bluegrass Situation called her, “a singular voice, one that can only be understood by being heard,” while Stereogum described the debut as, “an expert marriage of gracefully confessional songwriting with country-folk arrangements that recall Joni Mitchell.” Upon its release in the U.K., the album reached #1 on the U.K. Americana Chart and #1 on the Independent Album Breakers Chart and was awarded a five-star review from The Daily Telegraph who called it, “an absolutely perfect little gem of an album.” In April 2017, Andrews made her debut on the BBC’s legendary “Later…with Jools Holland” program.